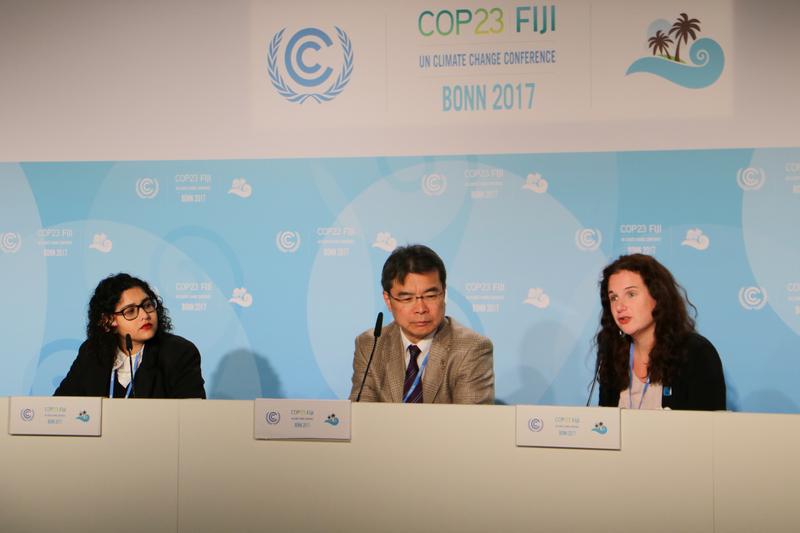 During a press conference in Bonn (Germany) during the annual Conference of Parties to the United Nations Framework Convention on Climate Change (UNFCCC), Peace Boat announced several commitments to continue collaborating for climate and ocean action with support for the Ocean Pathway Partnership of the COP23 Presidency. 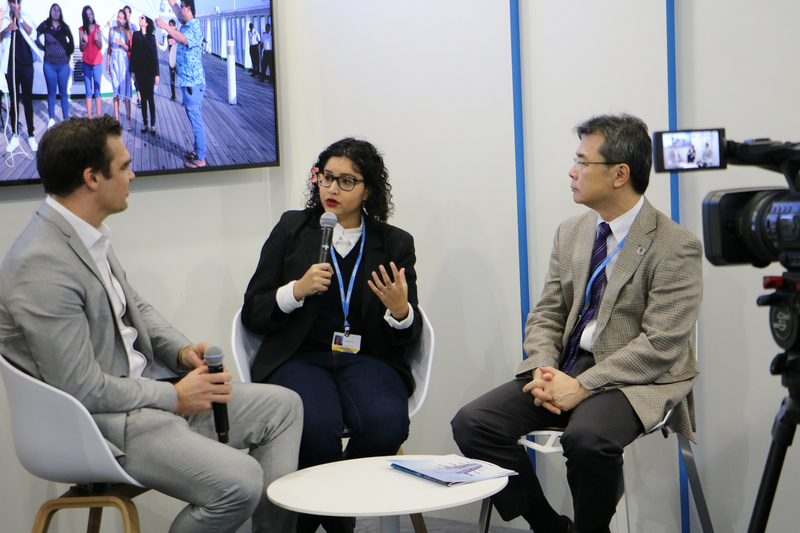 Building on its work on ocean and climate in 2017, Peace Boat commits as a representative of civil society to the Ocean Pathway, an initiative that will embody the important relationship between the Ocean and Climate Change to ensure the ocean is an integral part of the UNFCCC process by 2020. 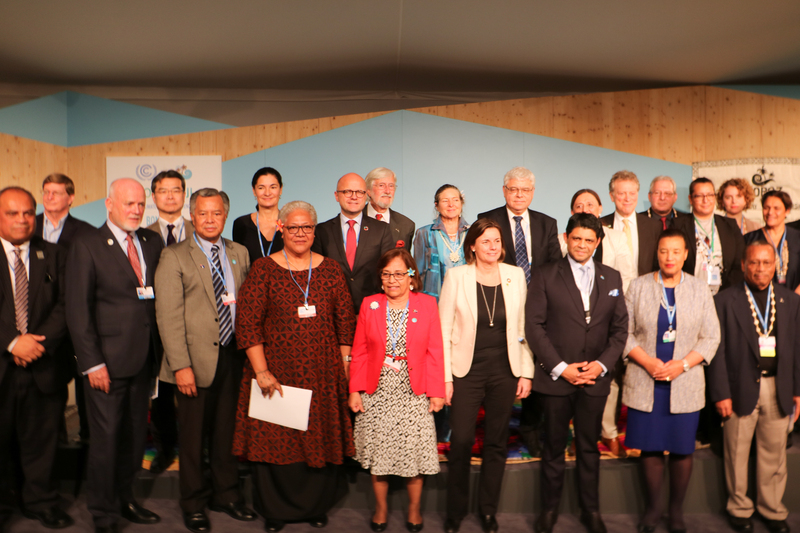 This partnership, led by the Fiji’s presidency, ensures momentum continues beyond COP23 and into full implementation with the rollout of the Paris Agreement. In a high-level event on November 16, heads of states, ministers and prominent representatives of various alliances and partners confirmed their commitment to this project by signing a formal communication. Yoshioka Tatsuya, Peace Boat’s director, said: “We are very proud to be part of this initiative from the beginning. With our current vessel and with our future Ecoship, we will work with the Fiji Presidency to build public support and raise awareness on the intrinsic links between ocean and climate health”. 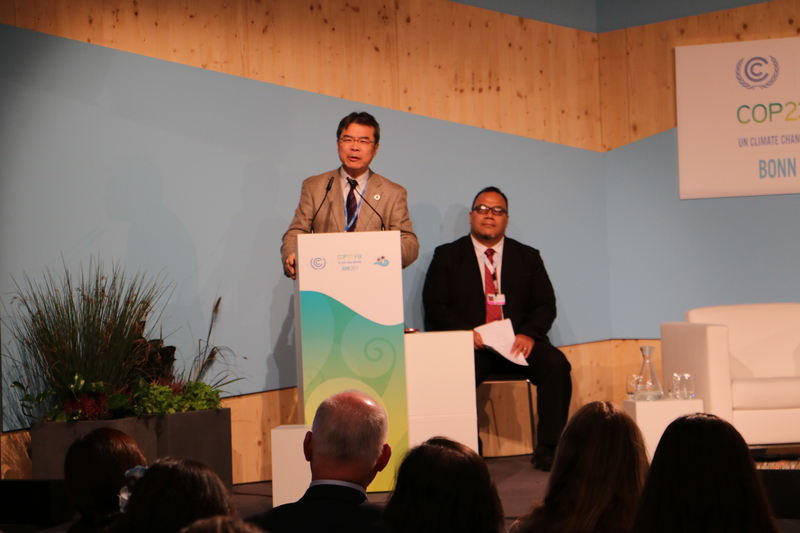 Noting the importance of ocean health to climate health and the need for ocean action together with climate action, emphasized by the COP23 Presidency, Peace Boat reaffirms its commitment to ocean and climate action with the Ecoship Project. The Ecoship was the first voluntary commitment to SDG14 at the Ocean Conference. It is a 60,000 ton, 2000 passenger capacity nature-inspired vessel which will set sail in 2020 as a flagship for the SDGs and climate and ocean action. Ecoship’s contributions will come not only through its technology and design but also through educational activities. Four annual global voyages will create the framework for hundreds of educational programmes, advocacy campaigns, and applied research, as well as for hosting international conferences and world-class exhibitions on green technologies, climate action, and ocean welfare. Peace Boat has been continuing its commitment to ocean and climate action with the Ocean and Climate Youth Ambassador Programme, Peace Boat’s second voluntary commitment to SDG14 and announced at the Ocean Conference in June 2017. This programme brought youth leaders from states on the front line of climate change and marine degradation to travel onboard Peace Boat’s ship in Europe and to New York, from September 22 to October 16. The participants were from the three geographic regions of the Pacific Ocean, Indian Ocean and Caribbean, including Fiji, Marshall Islands, Maldives, Seychelles, Trinidad and Tobago and Belize. They engaged with local, regional and national governments, civil society and the scientific community taking part in awareness-raising and outreach events in ports visited, including in France, Portugal, the United Kingdom and Iceland. At the same time, they were joined onboard by guest educators to assist in their capacity building, including Ms Christiana Figueres, Executive Secretary of the UNFCCC during the Paris Agreement. “We are very happy with the outcome of the programme. For this reason, we want to continue in the future and invite more young people from other countries to travel with us and tell their stories around the world”, said Yoshioka. During the press conference, a magazine with articles written by the youth, interviews and a Call of Action was presented. The magazine can be download on the Ecoship website. Another of the outcomes of the programme is a documentary titled ‘Against the Tide: a journey for climate hope’. 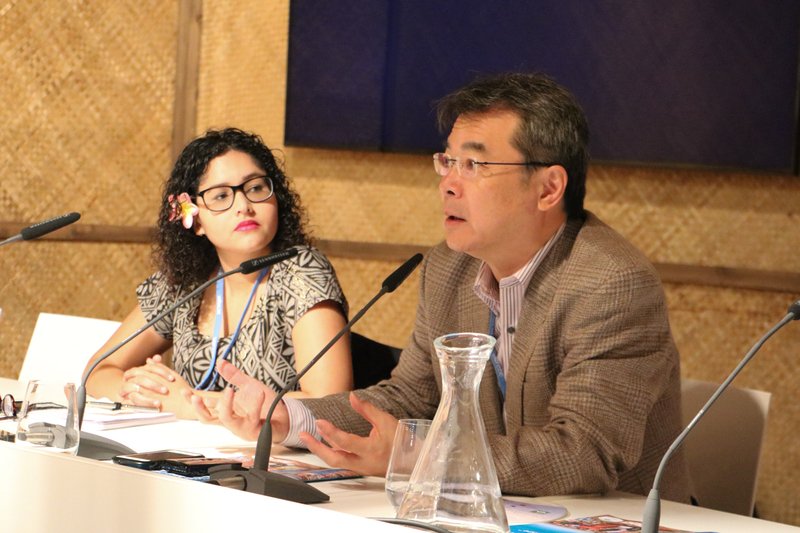 This short film was screened for the first time at COP23, in the Fiji Pavilion, to raise awareness about the fragility and vulnerability of the small island states. “We hope to screen the film in many places to inspire people from all walks of life across the globe to take environmental actions and initiatives which will contribute towards protecting the world that we live in”, said Karen Hallows, one of the programme’s coordinators.